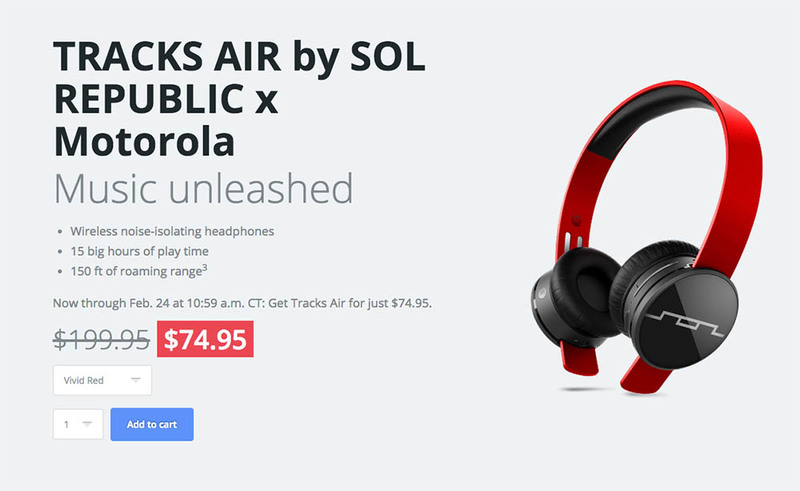 Motorola’s Valentine’s $100-off deal may be done, but the company replaced it this morning with a substantial discount on its $200 SOL Republic TRACKS AIR headphones and a buy-one-get-one free deal for its P4000 power pack. Today through February 24, a pair of TRACKS AIR headphones can be had for just $75 ($125 discount). Plus, if you spend $79 on a P4000 power pack, Motorola will hand you another for free. The headphones, which connect to your phone via Bluetooth, carry a 15-hour charge and 150 foot roaming range, come in four colors (blue, red, gunmetal, and white), include Dual-Mic CrystalTalk technology for voice calls, offer noise reduction, and have on-ear controls. The TRACKS AIR aren’t going to be audiophile enthusiast level cans, but $75 for a consumer-focused pair of Bluetooth headphones is a pretty solid deal. As for the P4000, you are looking at a power pack that hosts a 4,000mAh battery, which should be good for at least 1.5 full charges on most smartphones. And again, if you buy one, Motorola will toss in a second for free, just add two to your cart.